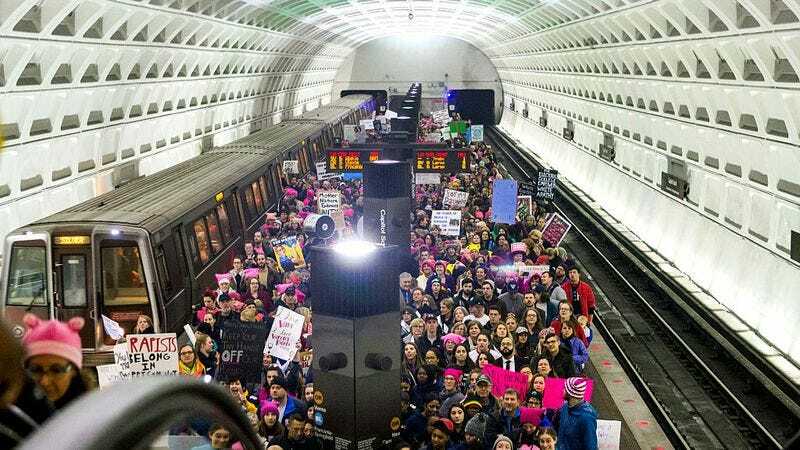 The National Mall is looking a lot more crowded this morning, as hundreds of thousands of people put on pink hats and converge on Washington, D.C.—the image above is from a D.C. Metro station earlier this morning—to protest the anti-woman, anti-LGBT, anti-immigrant, anti-Muslim, anti-human decency policies of our new president and vice president. The Washington march is just one of dozens taking place across the U.S. and around the world—even Antarctica is joining in!—today, including a Chelsea Handler-led march on Park City, Utah set to cut right through the middle of the Sundance Film Festival. The Women’s March on Washington has received some similarly high-profile celebrity support, like Fiona Apple’s mocking “Tiny Hands” chant recorded especially for the event and a star-studded after-party with performances from The National, Sleater-Kinney, Ted Leo, Samantha Ronson, Tig Notaro, Janeane Garofalo, and more. The rally began about an hour ago at 10 a.m. ET at the intersection of Independence Avenue and 3rd Street near the U.S. Capitol. The march itself begins at 1:15 p.m. ET and goes until until 5 p.m. ET. You can watch a live stream of the events from ABC News below.